Oh yum! Can't sleep so I made myself a cup of tea. Oh, how I wish I had one of these bars right now. Fun vignette, Kitty. Happy Halloween! ah it is so cute and adorable . loved the teacup it is marvelous . Hello Kitty, wow those pumpkin bars look so good. I love the cute mr. pumpkin head. Thanks for sharing this recipe at C&C with J&J. I adore pumpkin bars! Your little fairy garden is darling. I love those stockings! So cute and the grand kiddos would love them. 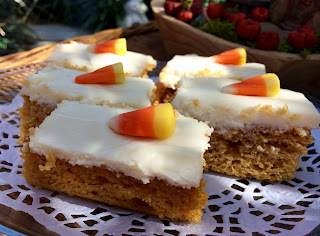 My mouth is watering with all of the treats and especially the pumpkin bars. Have a wonderful week ahead and Happy Halloween. Hi Kitty, great pumpkins bar. They look so cute with the candy corn. Glad to see it's set up outside. Mr. pumpkin head is adorable. Happy Halloween to you. Looks like you have the Recipes Generator down. Happy Halloween, Kitty! Tea is the perfect way to celebrate Fright Night (or any holiday for that matter!). I love your RA Duchess teacup. I was gifted the snack set a few years ago. Love the candy corn on your pumpkin bars and your pumpkin man. Yummy! I haven't made pumpkin bars in years. I love the cream cheese frosting! I did bake my first 3 loaves of pumpkin bread last Friday! Usually I would have made it 2 or 3 times by now....but the diet....:( Love your little tea party on the patio....the fairy garden/pumpkin patch is so cute! 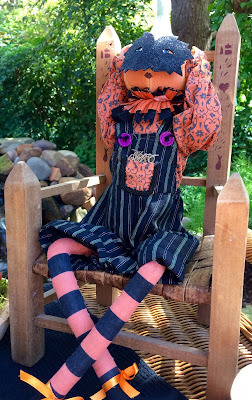 Mr Pumpkin head looks quite comfy sitting there with you! That table covering is adorable! Love all the fabric pieces together!Of course, the tea cup is so pretty. Enjoy the nice weather while you have it! It has cooled down here a lot but there is supposed to be a gradual warm up this week. Can't wait! Happy Halloween! Looks like a fun and yummy party. 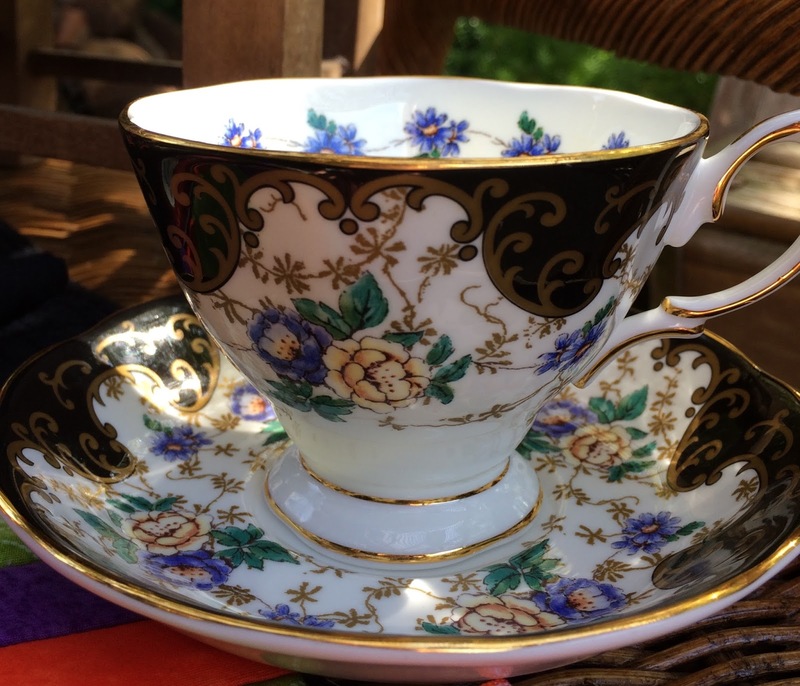 Your tea cup is soooooo gorgeous!! We are having a quiet Halloween, only 16 trick or treaters, and I think they're done. My husband says it's more candy for us, haha! 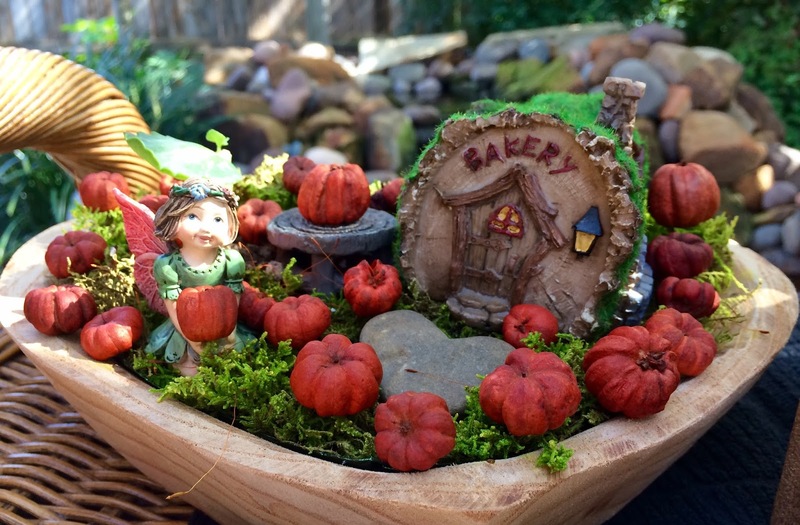 I do like the fairy garden decked out for fall and the bakery door is perfect for your home. The pumpkin bars look delicious and the RA teacup a pretty selection for tea this week. 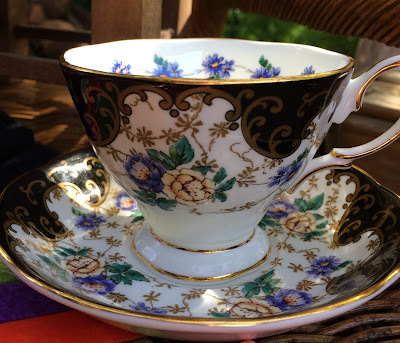 And your tea cup...what a beauty! Thank you for such a lovely post. Love to you! I'm drooling right here, right now! :) These pumpkin bars look delicious and I'm sure they are. I will definitely be trying them! I love your tea cup, just gorgeous. Mr Pumpkin Head is a cutie! Your talents never cease to amaze me. I'm glad you shared all this fun with us! Kitty, I am excited to try this recipe! I recently made pumpkin donuts and they were so delicious. I am craving more pumpkin! Thank you for sharing your recipe and tea with us! 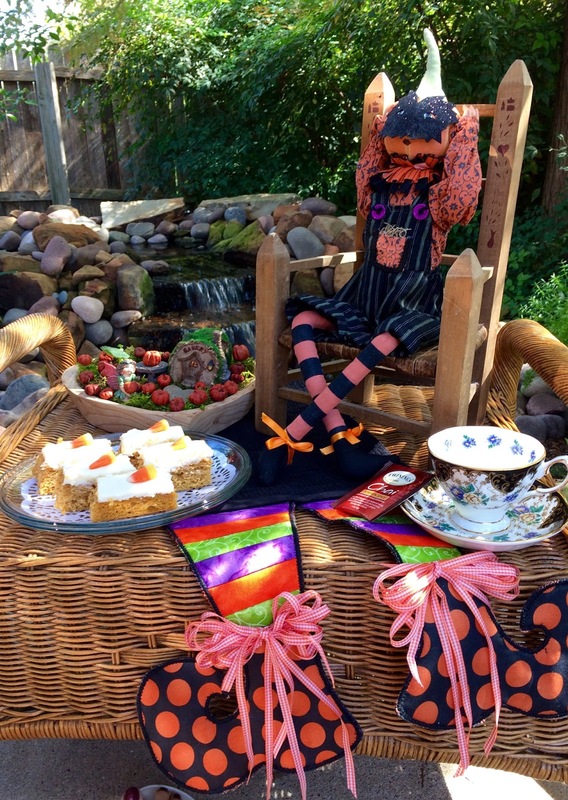 OOOOO - chai tea with your pumpkin bars sounds perfect! Love the candy corn on top too. Great recipe...great post...great Friend. =) Thanks for sharing with us at Weekend Potluck. And all this time I thought you were the bakery fairy! That is so cute. Thank you for sharing and linking your delicious Pumpkin bars. I love your outdoor setting, teacup and table setting Kitty. What a cute Halloween setting, Kitty! Your bars look so yummy and your teacup beautiful! I like the little scareacrow having tea with you! Kitty, how fun that it was such a pretty day that you could enjoy and outdoor tea. We have been having gorgeous weather here as well. We had a record number of trick or treaters because of it. Your runner is so cute and the pumpkin bars sound delicious! Anything with cream cheese frosting can't be bad, right? :) Thanks for sharing with SYC. We would just love your awesome Pumpkin Bars! Hope you have a great week and thanks so much for sharing with Full Plate Thursday. I have a similar recipe and it is so yummy! Cream cheese frosting....mmmm!! I love the idea of the candy corn on top of each piece.